Salta la coda con accesso prioritario ai Musei Vaticani e alla Basilica di San Pietro e goditi una mattinata senza problemi esplorando una delle collezioni d'arte più leggendarie al mondo. 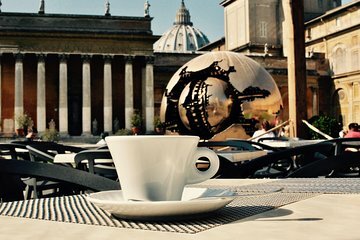 Inizia il tuo tour di 3,5 ore con una deliziosa colazione all'italiana mentre assisti a una speciale presentazione sit-down della Cappella Sistina. Poi, dirigiti all'interno per ammirare i capolavori del Rinascimento di artisti come Botticelli, Perugino e Raffaello e ammira la magnifica Cappella Sistina di Michelangelo. La cosa migliore è che questo tour per piccoli gruppi è limitato a 8 persone, assicurando un'esperienza intima e priva di auricolari con l'attenzione individuale della guida. Scopri di più con una guida esperta e senza cuffie! Horrible!! Talk about a cattle call, this tour was poor. Our guide Marina was irritated by any questions. Furthemore, she told group to meet her at the end? What does that mean? The group dismantled because she did not provide where to meet so would not choose this tour again. Our tour guide Simonetta was amazing - we learned so much from her ! having the private tour guide made all the difference. However, it was still crowded. Our tour guide was great! Very knowledgeable and friendly. We were able to see a room not typically viewed by the rest of the herd. The museums are so crowded that it does get old not the tour guide's fault of course. For someone really into art and history this is a great tour. I wish I remembered her name. Our guide was simply sensational! First off, it was supposed to be a small group tour. So we arrived at the meeting spot and a girl comes over and asks my name and informs my wife and I that we are the only ones on the tour! So we basically got a private tour. Breakfast was very nice, fresh, and tasty. She spent so much time with us it was really educational, extremely informative. ST. Peter's Basilica is about the most impressive church I think I've ever been in in my life. It's massive. The Sistine Chapel is everything it's cracked up to be. Great way to see the Vatican. We had a great experience thanks to a wonderful guide. She is married to a Vatican security man so we bypassed lines and sat with our backs to The Last Judgment in the Sistine Chapel. We had a fabulous tour of the Vatican Museums, Sistine Chapel, and St. Peters after a lovely breakfast in the gardens. Arriving early was the best decision since this was the end of summer, busy tourist season in Rome. We didn't feel crowded or rushed particularly since the scheduled group of 8 magically turned into our small group of 4 friends. Our guide, Chiara, was incredible - thoroughly knowledgeable, personable, and so adept at leading us along the way. After we cleared security and entered the museums, Chiara delighted us by opening her arms and commenting, Welcome to my office! Chiara's attention to the details of art, history, politics, her obvious happiness in her work, reverence and respect for this amazing site, and especially pointing out her favorite treasures made the time fly. This tour and our wonderful guide was the highlight of an all-too-short visit to Rome! An excellent tour avoiding the queues and access to areas not available to other tours. Our guide was enthusiastic and had an excellent knowledge of the Vatican museums, Sistine Chapel and St Peters. The talk at breakfast before setting off on actual tour set the scene for the rest of the tour. Our tour consisted of 6 people which added to the personal enjoyment. An early start but highly recommend this tour and Daniella was a first rate guide. Excellent tour of the Vatican Museum with a very professional tour guide. She is married to a Swiss Guard and lives inside the Vatican. You could tell that she loves her job and has a passion for it. No waiting in lines with this lady. Our guide was Daniela. We couldn't have been happier. She is married to a member of the Swiss Guard, lives in the Vatican, and clearly knows the place and it's history like the back of her hand. The tour was very well paced and interesting. I love history and art, and probably asked far too many questions she was great about it. This tour is very different than most. No headset. No large groups. And Daniela, whose English is excellent, brings an iPad with tons of pictures to help provide history and context. Long story short: this was one of the highlights of our trip, not just because of what we saw and learned, but because Daniela made the experience truly special.